Contracted by the Spanish construction group Cobra, BOURBON completed the installation of the first wind turbine at Cobra Wind’s Kincardine site, Scotland, off the coast of Aberdeen this summer. 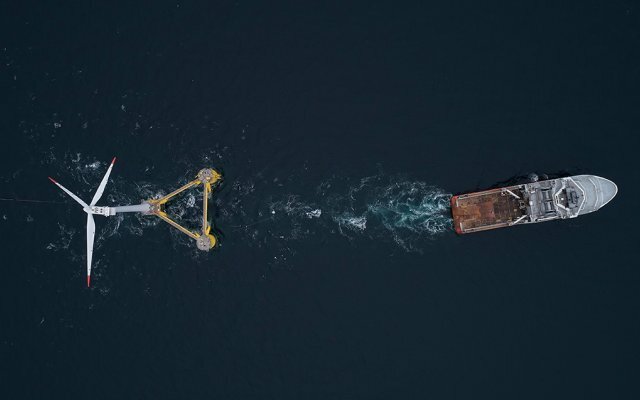 Bourbon Subsea Services’ experience in floating wind turbine installation enabled them to swiftly and efficiently execute the engineering phase of this turnkey project, initiated in May 2018. The delivery of the operational scopes, including towing the floater to Dundee, pre-laying the 4-leg mooring system and installing the fully assembled wind turbine on site, was optimized by taking advantage of the local supply chain. BOURBON project management team worked in a close collaboration with the main contractor, Cobra Wind, the designer of the semi-submersible floating foundations, Principle Power, as well as the mooring system provider, Vryhof. Read press release about Kincardine Offshore Windfarm Project here.